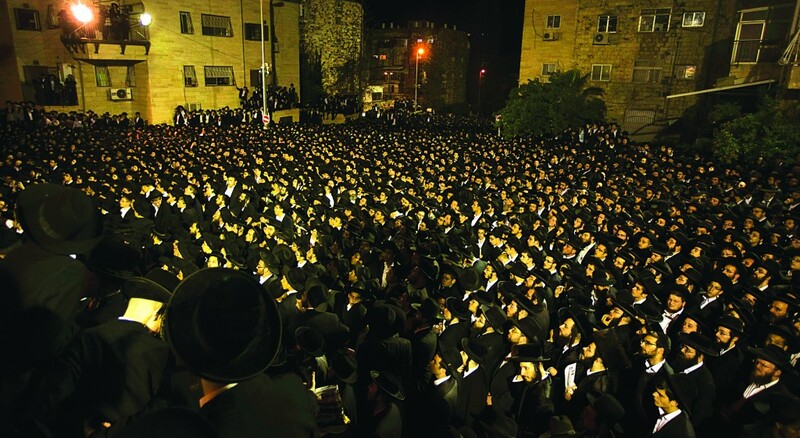 A huge crowd, estimated by police to number thirty thousand, participated on Thursday night in a gathering of tefillah and protest against the proposal to draft yeshivah students to the army. The rally was called by the Eidah Hacharedis, Harav Shmuel Halevi Wosner, Harav Meshulam Dovid Soloveitchik of Brisk, and Harav Shmuel Auerbach. At the appointed time, masses streamed towards the IDF Recruitment Bureau in Yerushalayim, located on Rashi Street, on the outskirts of the Mekor Baruch neighborhood. The dais was set up in the large square at the intersection of Chashmonaim and Gesher Hachaim Streets, and the crowd spilled over to adjacent streets. The event was opened with the recital of Tehillim by Harav Dovid Menachem Schneider, mashgiach of Yeshivas Grodna Beer Yaakov, with the crowd repeating passuk by passuk. Speeches were then delivered, with each speaker warning against the government’s plans to draft yeshivah students and intervene into educational curriculums of chareidi schools. The sense of opposition to the government’s plans spans the entire spectrum of chareidi Jewry, and there are various approaches among different communities how to combat these challenges. The speakers were: Harav Shmuel Auerbach, Rosh Yeshivas Maalos HaTorah; Harav Baruch Shmuel Deutsch, Rosh Yeshivas Kol Torah; Harav Tuvia Weiss, Gaavad of the Eida Hachareidis; Harav Moshe Sternbuch, Raavad of the Eida Hachareidis; Harav Dovid Tzvi Ordentlich, Rav of Beitar Illit; and Harav Moshe Tzadka. The event was closed by the recital of Tehillim by the Rachmistrivka Rebbe of Yerushalayim, followed by Kabbalas Ol Malchus Shamayim by Harav Yaakov Meir Schechter. The clear message of all the speakers was that we are not compromising on the privilege of being able to sit and learn with holiness and purity, undisturbed, and that our power is only in our mouths, to cry out to Hashem for salvation. There was a heavy security force present to prevent any of the protesters from approaching the recruiting office itself. During the rally, the Rabbanim several times repeated their warning not to engage in violence or cause a chillul Hashem. Unfortunately, after the crowd dispersed, a few youths hung around and engaged in clashes with police. The media reported that six officers were injured. This article appeared in print on page 1 of the May 17th, 2013 edition of Hamodia.